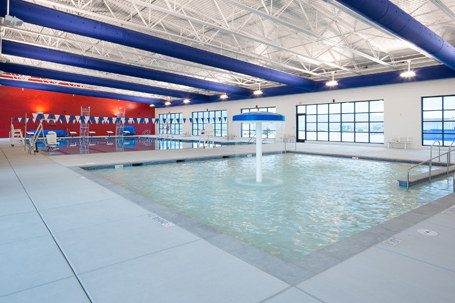 The White Pine County Aquatic Center is an indoor swimming facility featuring a 25-yard pool with exciting climbing walls on the deep end as well as a smaller kid-friendly pool complete with an umbrella-shaped water feature. To meet the intense demands of an indoor pool environment, the building features many sustainable strategies and comprehensive energy efficient modeling such as inter-locking the pool’s water heating system and the natatorium air heating system so that only one can work at a time, saving money by reducing the electrical services size. Approximate savings was $200,000. Other sustainable features included low flow fixtures which were used throughout the facility, daylighting and multi-step interior electric lighting strategies were employed to reduce the electrical consumption, and high-impact, low-cost finishes were used to increase longevity of the facility without increasing the cost. The community is now delighted to offer water aerobics, fitness lap lanes, and a new swim team.